Reporters from many of the nation's most influential newspapers await a debate concerning the repeal of slavery in the US House of Representatives in the movie Lincoln. The first movie I went to see was Steven Spielberg's Lincoln about a week after Thanksgiving. 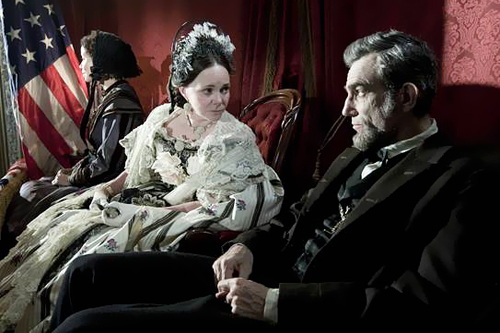 Daniel Day-Lewis portrays Abraham Lincoln, our nation's 16th president, and the film depicts his efforts to get Congressional approval for the adoption of the Thirteenth Amendment to the US Constitution that would abolish slavery in the United States. The film takes place in the early months of 1865, just prior to the end of the Civil War. Eerily similar to what we just saw play out on our television screens in recent weeks, Lincoln was pressing a "lame duck" House of Representatives to join the Senate in voting for that measure prior to the seating of the new Congress (it would happen in March of that year). The Democrats suffered a major defeat at the ballot box in 1864 and were going to lose 32 seats in the new 39th Congress while the Republicans would increase their own numbers by 48. While having such a large majority (a 132-40 advantage with 27 others from other parties) would not normally be something to worry about, there were also 51 vacant seats for those states that had seceded from the United States nearly four years earlier that had to be factored into this equation. As the party who advocated the end of slavery (the Emancipation Proclamation was enacted 150 years ago this month by a presidential decree related to his constitutional authority as the nation's commander-in-chief), the Republicans realized that this amendment must be passed prior to the ending of the war and the resulting readmission of those slave-friendly states to the Union. With that conflict in its final throes (and peace negotiations being conducted between the two sides in secret), Lincoln and his political proxies were forced to entice as many of the defeated Democrat representatives to vote with the Republicans to ensure the amendment's passage before the Confederate States of America could surrender and throw their support against it. It was not a pretty process (some equate it to watching sausage being made) but their efforts succeeded in securing the votes necessary for passage to the states (the final step, ratification, would not be completed until December when Georgia's approval secured a three-fourths majority in support the amendment). The part that touched upon journalism involved a scheme by Democratic leaders in the House to get one of the amendment's strongest supporters (Pennsylvania Republican representative Thaddeus Stevens, played by Tommy Lee Jones) to state his then-radical position favoring total racial equality on the floor of that body in a public debate on the amendment (which, by the way, made no mention of such a status elevation for former slaves). To ensure that his anticipated comments would get maximum exposure, they invited a host of prominent newspaper reporters to attend that session (the photo above shows them in the gallery) to capture his words for a national audience. Needless to say, Stevens walked right up to that line but never uttered his true feelings, helping his party and president keep their less ardent rank-and-file members within their camp. As the viewer sees both the amendment and the peace talks happening concurrently, it turns into a race to see which one would be accomplished first (the amendment was approved by a little over two months). While not journalism-specific, the electrical telegraph plays a vital role in this film. The Civil War ushered in this then state-of-the-art technology of rapidly disseminating information over great distances for the purpose of enhancing military command-and-control between the front lines and Washington, DC (and news-gathering organizations incorporated this paradigm shift into their own operations, creating what is popularly known today as the "inverted pyramid"). In the clip provided above, Lincoln was waiting for confirmation from Lt. General Ulysses Grant on a personal message he sent to his top field commander when he evoked Euclid's "self-evident" postulate to support why he was pushing so hard for the ratification of the pending amendment. Although I know Morse code, I was unable to transcribe what was being sent because the viewer did not hear the actual message but its "inverse" through the mechanical device that was sending the intelligible strings of dots and dashes. A similar telegraph "cameo" was later seen during the actual vote for the amendment. A field telegraph was set up in front of the US Capitol building to transmit the roll call vote to Grant at a distant location (he needed to know its progress because he was physically delaying a Confederate peace negotiating team en route to Washington to conduct talks with Lincoln and Secretary of State William Seward). While this means was used for long-haul communications, local updating employed literal runners to pass information back and forth between the Congress and the White House during that crucial debate and vote. Today's information-sharing devices are exponential steps beyond what the people of Lincoln's day had at their disposal but it was nice to see how such transfers were conducted in the days before Blackberrys, iPhones, Facebook and Twitter. The next movie that I saw was over the period between Christmas and New Year's Day when I left work early to catch a screening of Argo at one of our local "dollar saver" theaters. Based on a true story (and, after seeing this online review, I will add that it was very loosely based), I was enticed to see it because of the suspenseful trailers on television and a tangential connection to the events portrayed in the film (I was a college freshman at the time of the US embassy takeover and I have a good friend of mine who lived there for several years as a high school-aged dependent of an American government employee stationed in Teheran). As I said initially, I'm not going to provide a thorough review of the film so I will skip over the many instances of artistic license the creators took to sell this story as something worthy of John le Carré or Tom Clancy and focus on the journalism aspects interwoven into the story commonly referred to as "the Canadian Caper". 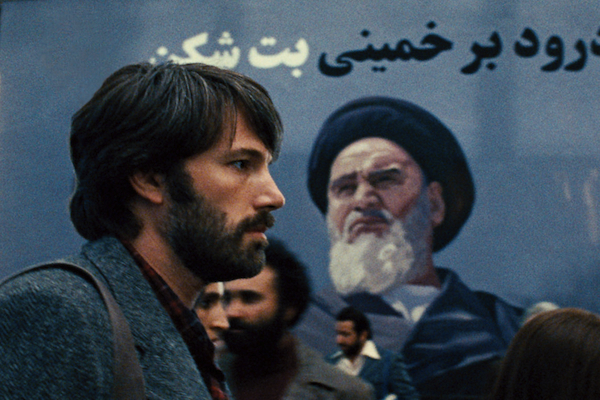 The movie starts with an prologue addressing the history of Iran and the rationale for the 1979 Iranian Revolution (it was effectively done with a monotone female voice interspersed storyboards, newsreel and video footage) then drops the watcher off on the day of the actual takeover (November 4th, 1979). During the commotion, six embassy workers were able to escape into the streets and eventually make their way to the Canadian embassy where they were hidden for several months prior to their departure (with Mendez's assistance) on January 28th, 1980. The Central Intelligence Agency exfiltration operative supposedly gets the inspiration for a cover story to get the hostages out while seeing Battle for the Planet of the Apes on television while talking to his son. He pitches a phony movie story to his superiors after hearing some of the ideas that they come up with (bicycles are mentioned in the clip above). Once he is given the go-ahead, he must create everything that goes behind the launch of a feature-length science-fiction film, to include a screenplay, storyboards, and a fake studio (with a real-life person who is there to answer the phone if their validity is questioned while trying to leave Iran). He picked that genre due to the wealth of exotic locations that Iran would offer (this occurred in the wake of the hugely successful first Star Wars installment which had similar venues in its story). Once everything is in place, Mendez (now in the identity of a Canadian movie producer) makes his way into Iran to conduct the operation. He meets the six at the ambassador's residence and presents them with their new identities as members of an advance crew scouting out locations. The very next day, he takes them out for a test run at a crowded bazaar which proved to be a near-disaster but was necessary to give them some level of confidence for their attempted exit the following day (the rush was due to the Americans believing that Iranian officials would piece together shredded documents and discover that the six were missing). To add more drama to the film, the White House ends the mission and cancels their flight reservations the night before because of the potential conflict with a military operation to rescue the main contingent of hostages from the embassy. Needless to say, Mendez ignores the order and brings the six to the airport as scheduled to board a Swissair flight out of the country. In full crisis mode, we see Mendez's superior working every angle to have the reservations reinstated (he even calls the president's chief of staff while pretending to be an official from his children's school in Georgia) and they are miraculously validated on the airline counter agent's second confirmation attempt. They make it through two other security checkpoints before being allowed to board the plane at the last available minute. The final check did involve the lead official calling the fake studio with the call being picked up on the final ring before he would have hung up. While the group takes their seats on the plane, a government official is able to connect a photograph taken at the bazaar the previous day with one of the pieced-together embassy documents and he contacts the airport to look for them. Realizing that one of the "Canadians" was the individual of interest, the final security official attempts to stop them (although experiencing a series of time-consuming setbacks along the way). In an armrest-gripping scene, a group of vehicles begin to follow the plane down the runway as it attempts to take off, firing warning shots to get it to stop. When the airliner lifts off of the ground, that contingent nearly slams into the security fencing at the end of the runway. We next see the interior of the plane and the emotional reaction of the group when the flight attendant announces that they had departed Iranian airspace (by international agreement, airlines are not allowed to serve alcohol to passengers until they crossed outside the Islamic country's borders). The movie ends with Mendez tying up some professional and personal "loose ends" and we are also treated to video footage of the actual individuals involved in this "caper" being lauded and recognized by a relieved (and thankful) nation. As I said earlier, this movie plays very loose with the actual facts surrounding this historical event. While some of those are documented in the link I provided, one that went unnoticed was the amount of television newsclips that were incorporated into the film. While I am a little foggy about how much time was actually devoted to this long-term event (I was a full-time pre-med student with a part-time job so I did not have a lot of time to devote to watching the news), the movie portrays that medium in a far more widely visible manner than I remember it being "back in the day". 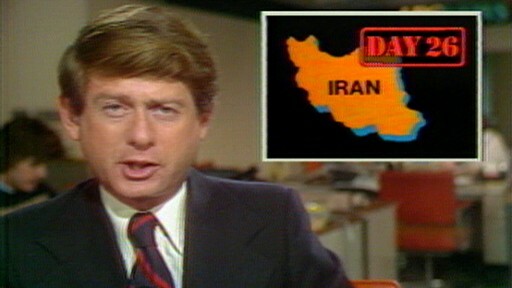 Prior to CNN initially going on the air on June 1st, 1980 as a 24-hour news channel, there were only three broadcast news outlets that the majority of Americans relied upon to get their daily news from (I am intentionally skipping newspapers since they were not featured in the movie). In a majority of the movie's scenes, you see at least one television on with a report about the hostage crisis being played at that moment (and this is at various times throughout the day and night). I remember network news only occupying a 30-minute block of time and with all of them happening simultaneously from 6:30-7PM. Once they signed off, your next television news "fix" normally didn't come until the 11PM local report on their affiliates. I do admit that there were probably a lot of news specials that were devoted to the crisis (one notable program, ABC's Nightline, started four days after the takeover to give viewers daily updates opposite NBC's The Tonight Show with Johnny Carson at 11:30PM) but that would have happened mostly in the primetime hours (8-11PM) and not during the normal business day (during the Watergate hearings, it literally took the action of Congress to preempt the widely popular--and very profitable--daytime "soap operas"). The other component of this observation is in the number and location of some of those sets. Unlike today, where flatscreen monitors are ubiquitous in our modern society, televisions were a scarce commodity out in the general public. In one scene, we see a security desk at a government agency with a portable television aglow with the latest news. As a former military intelligence specialist, I cannot personally remember seeing a TV set in an operations center until the late 1980s (at the earliest--let alone three like the movie depicted above) so the idea of the guards being more informed than the folks that they were protecting was a little far-fetched for me. I do realize that the makers of the film needed to use these gimmicks for the purposes of flow and familiarity; however, one must do their homework to ensure that such a device is grounded in the generation they want to portray and not in the one they are presenting it to. 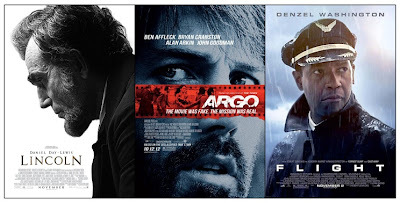 Two days after Argo, I went to see was Flight, a movie that did not borrow any direct history into its making (no such actual catastrophic event has happened, unless you count the specific fault that brought down an Alaskan Airways jetliner down over the Pacific Ocean back in January 2000 with the loss of all 88 people onboard). It begins on a very story morning in Orlando, Florida where we see William "Whip" Whitaker (played by Denzel Washington) and one of his flight attendants waking up less than two hours prior to their scheduled trip to Atlanta. Hung over and feeling the effects of getting very little sleep, Whitaker takes a snort of cocaine to help jump start his day of piloting a passenger aircraft. He makes it to the airport and to his plane (the fictional SouthJet flight 227) where he meets the rest of his flight crew who are preparing the passengers for departure. During his remarks, we see Whitaker discretely pouring three small bottles of vodka into a pitcher of orange juice that he takes into the cockpit for consumption. The weather poses some issues for their takeoff and ascent to a safe cruising altitude that makes the experienced pilot take some unorthodox actions to reach the calmer higher levels, but once there he hands over control to his co-pilot and tries to catch a little nap on the short trip to the Georgian capital. It is right before the plane starts to make its final descent when a malfunction of the plane's elevator assembly jackscrew jolts him awake and pitches the plane into a steep dive. 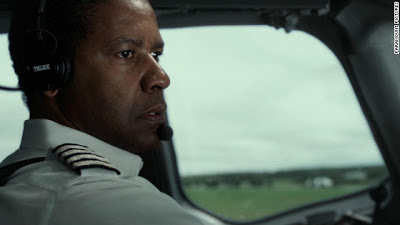 Through pure aviation instinct, Whitaker instructs both his co-pilot and the lead flight attendant through a series of unconventional actions to correct for this problem, to include momentarily inverting the plane, prior to a controlled crash landing in a field away from any populated areas. Despite his heroic actions, six of the 102 passengers and crew are killed, including the attendant that he slept with the previous night. Whitaker was knocked unconscious upon impact and wakes up in a hospital where he finds out what had happened from a former coworker (who now serves as a representative of the pilots' union) and accident investigators. Unknown to him, samples of his blood were drawn and analyzed (as is protocol in any aircraft accident) that indicate the presence of alcohol and drugs in his system at the time of the crash. While a lawyer representing his union was able to get those tests dismissed on testing technicalities, there is the problem of those missing bottles from the drink cart and that turned up empty in the trash bin (due to the bad weather, the beverage service was cancelled so only crew members had access to its contents). Whitaker will eventually have to provide his best guess to the lead investigator in a National Transportation Safety Board public hearing towards the end of the film. Leading up to that moment, we learn about the depth of his alcohol and drug dependencies, his failed marriage and strained relationship with his son, and his ability to always escape the consequences of his actions due to the actions of "enablers" (and that is made very obvious when he turns up drunk the morning of his hearing and his union rep friend and lawyer enlist Whitaker's regular dealer to make him presentable for that board). Although he is still inebriated for that public event, he does provide the right answers for the inquiry panel members to potentially mitigate--or even escape--any penalties for his actions in the crash. Only when the finger of blame begins to move towards the deceased flight attendant (a recovering alcoholic who, because Whitaker's blood test was inadmissible, was the only crew member to officially register positive on the mandatory screenings) that he admits to being an alcoholic as well as to his personal culpability in all of the illegal actions related to the crash. In the following scene, shot inside a federal prison about a year or so later, he tells his Alcoholics Anonymous support group that was the moment when he hit his "life long limit for lies" and he could not tell one more untruth (if he would have implicated the deceased attendant for those bottles, he probably would have escaped jail, the loss of his pilot license, and his reputation for saving all but six of the souls he was entrusted to protect on that fateful day). He also says that, despite his penal surroundings, he felt free for the first time in his life. The movie ends with his son visiting him at the jail and asking if he could interview his father to help him write college admission essays. The topic of the project was "the most fascinating person that I never met" and when the younger man asks the older who he was, the elder replies "good question". I know that I skipped over a lot of the "filler" (specifically an introduction to and a romantic interlude with a fellow drug abuser who eventually leaves him when she realizes that Whitaker's descent into alcoholism would be an impediment to her own sobriety battles) but this, in my opinion, was not as important to the movie as the pilot's own biography and struggles. I do not want to sound overly morbid but this movie caught my interest because of the accident scenario. I have done a lot of flying in my life and, luckily, have never come close to a real-life emergency while in the air. The computer animation as well as the actions on the soundstage added to the havoc and realism the creators of the film wanted to portray in those several minutes of sheer terror. I was the same way when the television program Lost premiered back in 2004. Seeing the mid-air event previews had me glued to the screen for their premiere episode; however, when no exterior depiction was shown of Oceanic Flight 815 going down in that initial 60-minute block, I turned it off and never watched it again (the true reason for the crash was not given until the final two hours of the second season). If Whitaker had been anything other than an airline pilot, the chances of me watching yet another cinematic depiction of alcoholism or substance abuse would have been far lower. 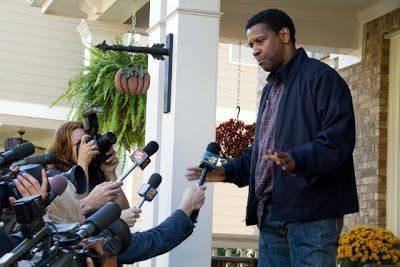 On the journalism angle, there were several scenes where the news media was incorporated in order to move the story along. Because a commercial plane crash is one of the biggest events that a reporter or anchor may cover in their career, the obligatory televisions showing clips of breaking news of the crash were present in Whitaker's hospital room as well as the bar where he first met the lawyer his union hired to represent him. The plane crashed near a church that was hosting a small ministry event at that very moment and grainy cellphone video of the plane flying overhead before bellying into the ground in a nearby field was captured and repeatedly broadcast on several occasions. When his dealer comes to visit him in the hospital, he brings Whitaker over to the window to see the large contingent of news vans and satellite trucks on the hospital grounds. Anticipating that the press would also be staking out his apartment after he was discharged, the pilot decides to stay at his father's farm to avoid the press. When they eventually track him down there, he decides to see his ex-wife and son in an intoxicated state which resulted in an almost unflattering situation that was captured by reporters monitoring that residence (he makes a plea for his family's privacy and is escorted away by a police officer who was originally dispatched to forcibly remove him from the premises). While CNN's primetime host Piers Morgan has two cameos in the film (one related to the release of the "black box" audio recording from the crash and one interviewing the still-hospitalized co-pilot), no other national-level media personalities are portrayed, leaving the bulk of the reporting to fictional local reporters and television personalities. As I mentioned earlier, all three of these films are enjoying critical acclaim and will most likely be nominated for a variety of awards in the upcoming film honors cycle (Screen Actors Guild, Golden Globes, Academy Awards). While I am not a member of any of these organizations (and do not get to vote for any of them), I would have to pull for Lincoln as my favorite for best picture. To me, it was the most enjoyable cinematic experience of the three films. It had a world-class cast (to include Sally Field as Mary Todd Lincoln, David Strathairn as William Seward, Joseph Gordon-Levitt as his older son Robert, and Hal Holbrook as Preston Blair), realistic-looking sets, exquisite costuming, and enjoyed the overall direction by the one and only Steven Spielberg. To satisfy those who might critique any historical inaccuracies, the screenplay relied heavily upon the research conducted by renowned presidential historian Doris Kearns Goodwin for her 2005 book Team of Rivals: The Political Genius of Abraham Lincoln (this book received a lot of attention in the wake of President Obama's first election victory because he said that he would emulate Lincoln's strategy of placing political rivals into his cabinet). The only spoiler to my prediction might be a movie that opens in wide release this weekend, Zero Dark Thirty, about the raid that took down al Qaeda leader Osama bin Laden back in May 2011 so I will have to reserve my final judgment until after I see it (and its depiction--if any--of modern journalism).